It was printed "マツシマ" in Katakana chatacter. We can check it in a more clear copy here. I'm glad to find your posting. Sorry, a map publisher name in your version is "惠比壽屋"
The "笑壽" is pronounced same "惠比壽(Ebisu)". I notice that many of the Japanese place names on the map are in katakana, including Matsushima (マツシマ), but Ulleungdo is labeled in kanji (竹島 -Takeshima). Likewise, other larger islands. such as Tsushima (對馬), are labeled in kanji, but their smaller, neighboring islands are generally labeled in katakana. 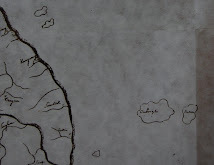 Is it possible the mapmaker used a system whereby he labeled main islands in kanji and their neighboring islands in katakana? 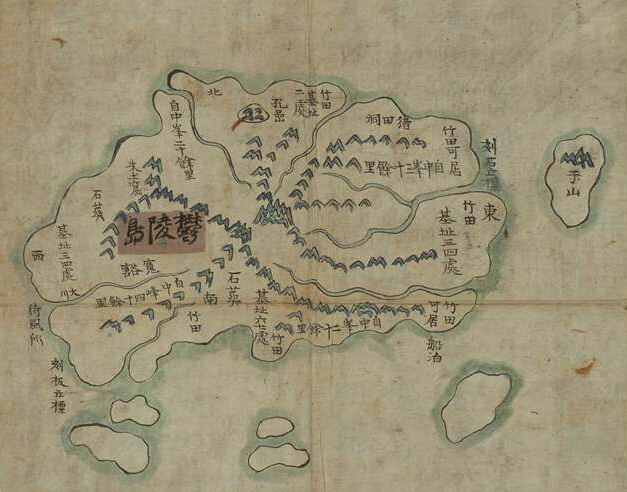 If such a system was used, maybe the "Matsushima" (マツシマ) on this map was not referring to Liancourt Rocks, but rather to Ulleungdo's neighboring island of Jukdo (竹島)? That would explain why the two island are so close together on many similar maps and why Matsushima is drawn as one island instead of two. The Japanese did not have such a distinguish system with Kanji-or-katakana character. The difference of Kanji or Katakana is only design from an aesthetic point of view. And, this map is a direct descendant of Nagakubo Sekisui's map. Therefore, Matsushima on this map is Liancourt Rocks definitely. 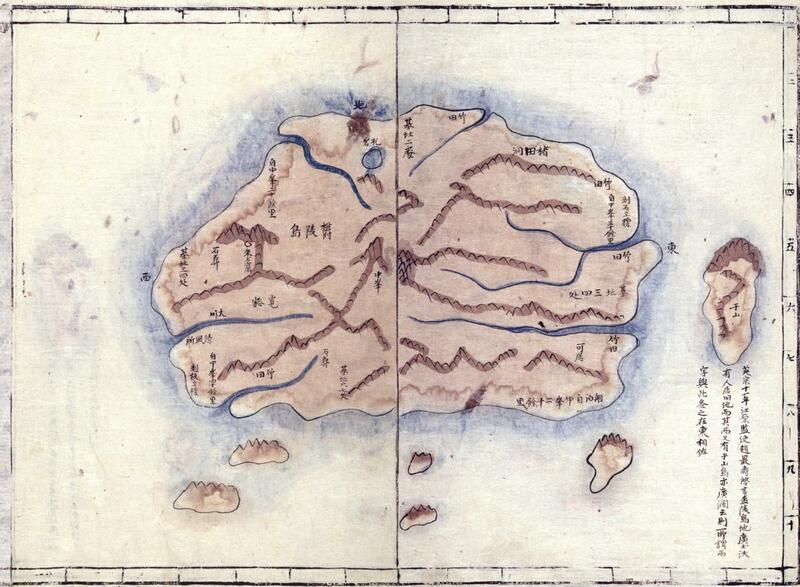 >Is it possible the mapmaker used a system whereby he labeled main islands in kanji and their neighboring islands in katakana? It’s very interesting way of thinking that Japanese do not think of. So this マツシマshould be Liancourt Rocks even though it is not drawn in two islets. At this time of the period Japanese might think 竹島（鬱陵島）belong to Oki district. Thank you for helping me with this map and for giving me your opinions on Matsushima (マツシマ) being written in katakana. 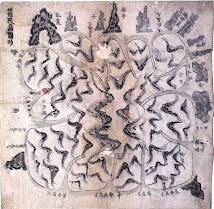 However, the fact that this map was based on on Nagakubo Sekisui's map does not disprove my theory. 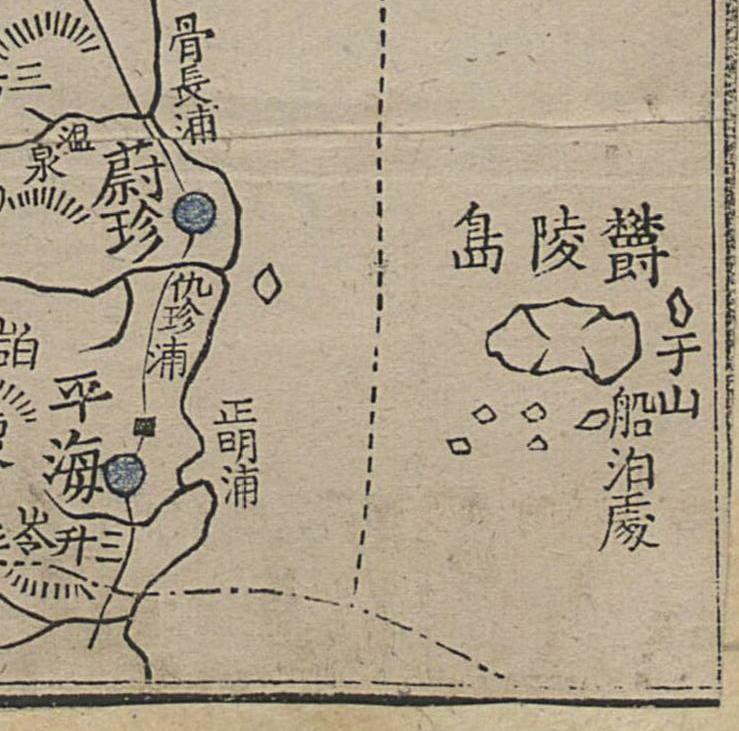 First, on Nagakubo's map, Matsushima was written in kanji, not in katakana. Why did the 1864 mapmaker change the name from kanji to katakana? 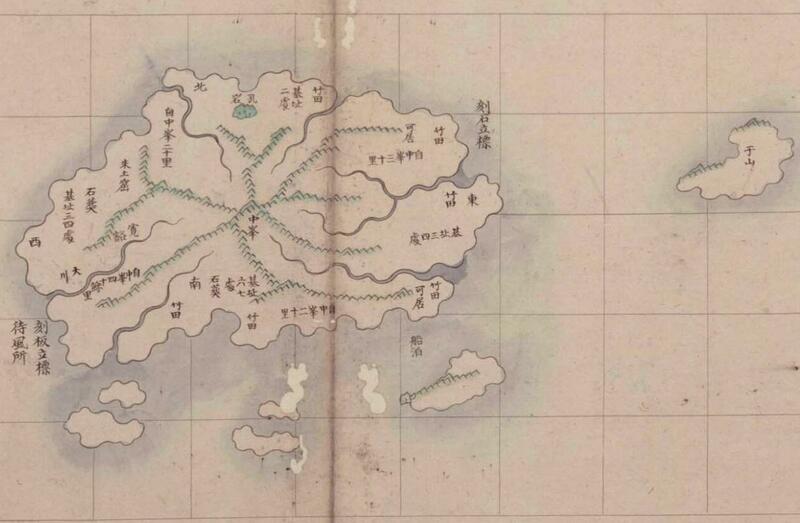 Second, on the 1864 map, Matsushima was drawn a little smaller and closer to Ulleungdo than it was on Nagakubo's map. Why did the 1864 mapmaker make those changes? 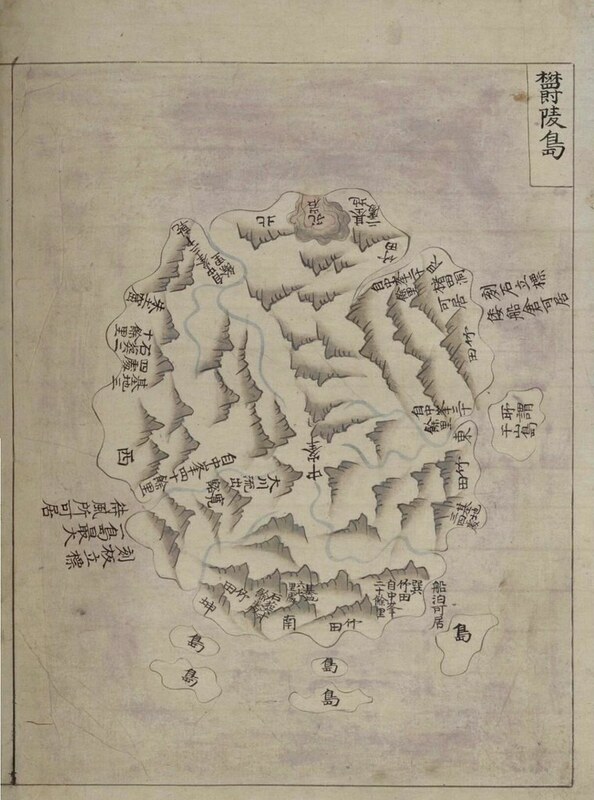 Actually, even on Nagakubo Sekisui's 1779 map, we cannot be sure that Matsushima was referring to Liancourt Rocks since it was drawn as one island, not two, and had text near it saying that it was in sight of Korea. 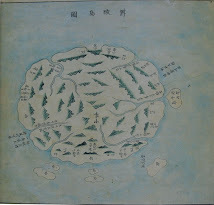 1779 was more than eighty years after the Japanese-Korean dispute over Ulleungdo, when An Yong-bok said that Ulleungdo's neighboring island of Usando (于山島) was also called "Matsushima" (松島). 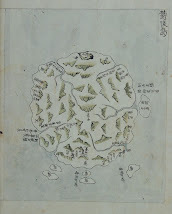 Even if Nagakubo believed Matsushima to be Liancourt Rocks when he made his map in 1779, maybe the mapmaker in 1864 believed Matsushima to be Ulleungdo's neighboring island of Jukdo. 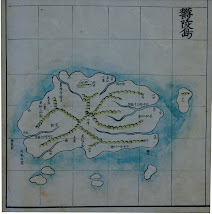 In 1882, for example, King Kojong said that Ulleungdo's neighboring island of Jukdo was also called "Songdo" (松島), which is pronounced "Matsushima" in Korean. 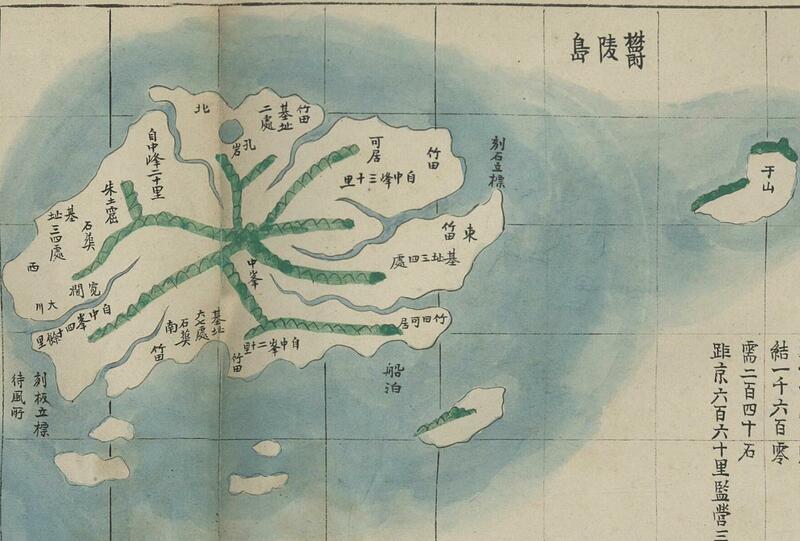 Again, maybe the 1864 mapmaker was referring to Ulleungdo's Jukdo. 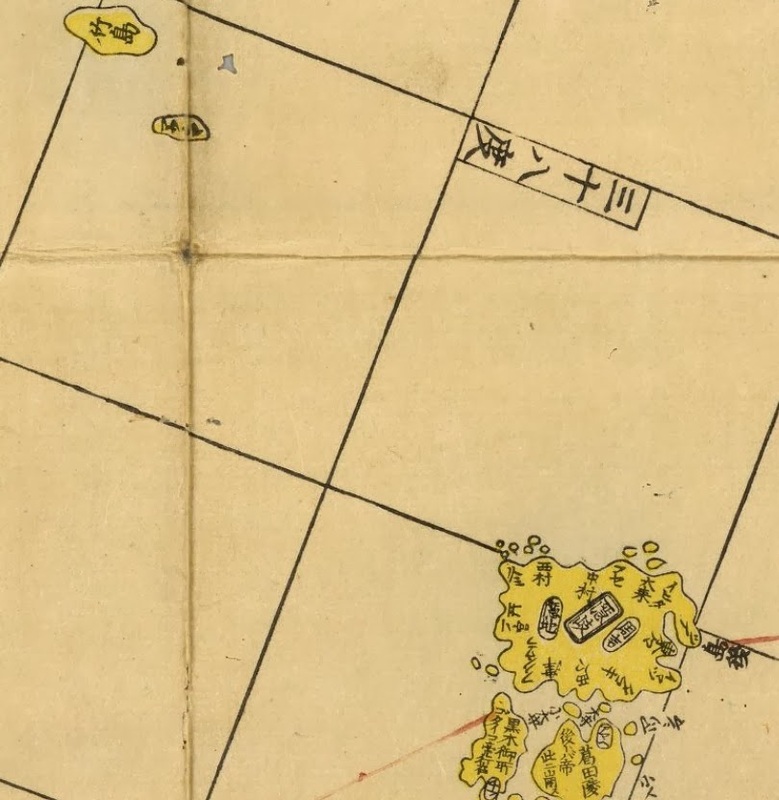 Did the 1864 mapmaker change any of the other names on Nagakubo's 1779 map from kanji to katakana of did he change only the name for the island labeled "Matsushima"? 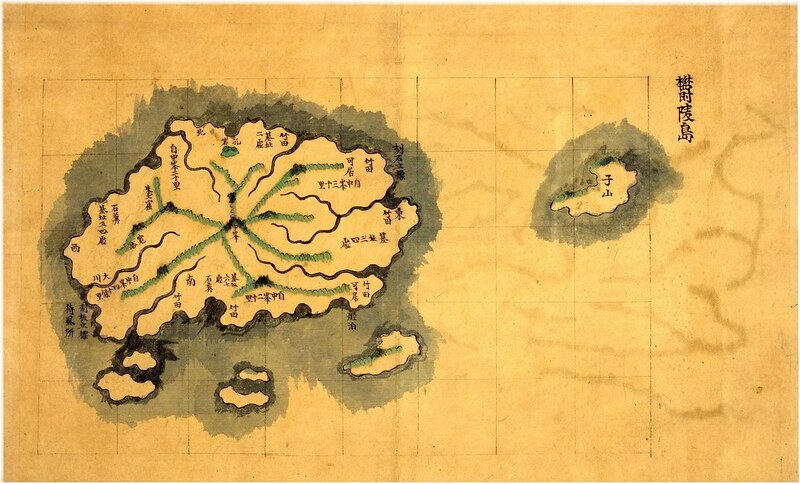 If he only changed the name for "Matsushima," then that could suggest that the 1864 mapmaker had more information on the island than Nagakubo had in 1779 and changed the name to show that it was a neighboring island of Ulleungdo. I have a copy of this map that I just had framed. It is hanging in my entryway. We should call Mr.Bevers' house as "US Takeshima research center". If anyone want to have this map for interior art item. The new print of this old map is available for purchase for a mere $15. Sorry, Japan's sales tax rose to 8 percent from 5 percent in this month. Perhaps, it costs ￥1,620 without shipping costs. 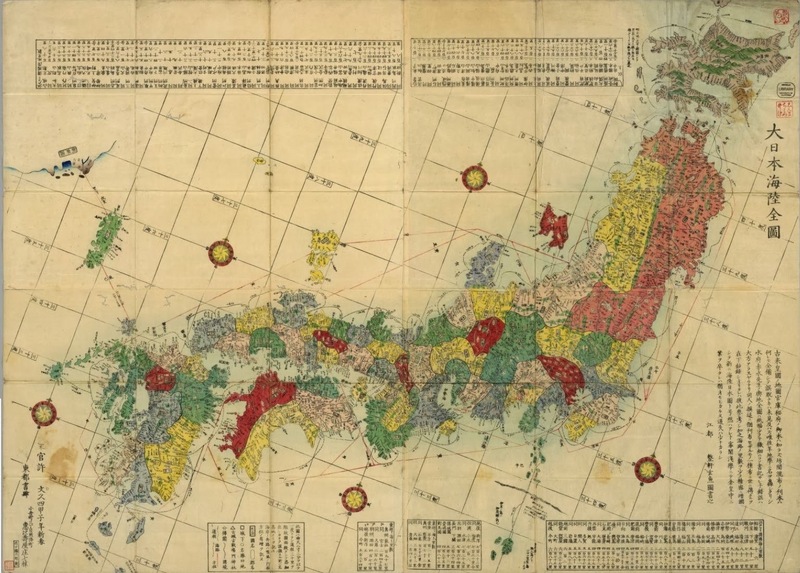 What do you think an original of the 1864 map might cost in Japan? 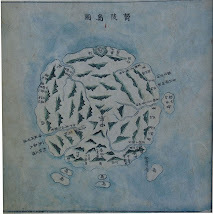 The current prices of original antique map　"大日本海陸全圖". That would be a reasonable price depending on the conditions. 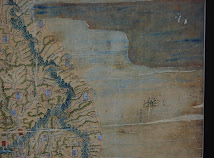 Their Ukiyoe prints map with natural dye color fades easily by the UV ray, lamp lights and closed acid paper . I paid only $150 for mine, but it was not in very good condition. There were a few tears, and it was coming apart at many of the folds. The paper is very thin and light. It was professionally framed under UV-protected glass and on top of special matting. It also has a back covering that helps seal it from dust. It may still fade over time, but it is such a beautiful map that it seemed a waste to just leave it folded up in some special storage box. The link below shows what is printed on the map I own. Does that mean that some of the maps were made before 1864? The revised version in 1854 is almost approach to perfection. Here is the perfect version in 1864. 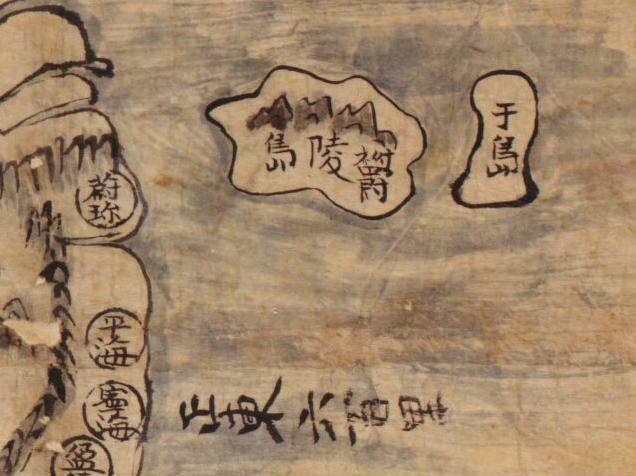 By the way, on the 1853 map, what is written between 是 and 高麗? 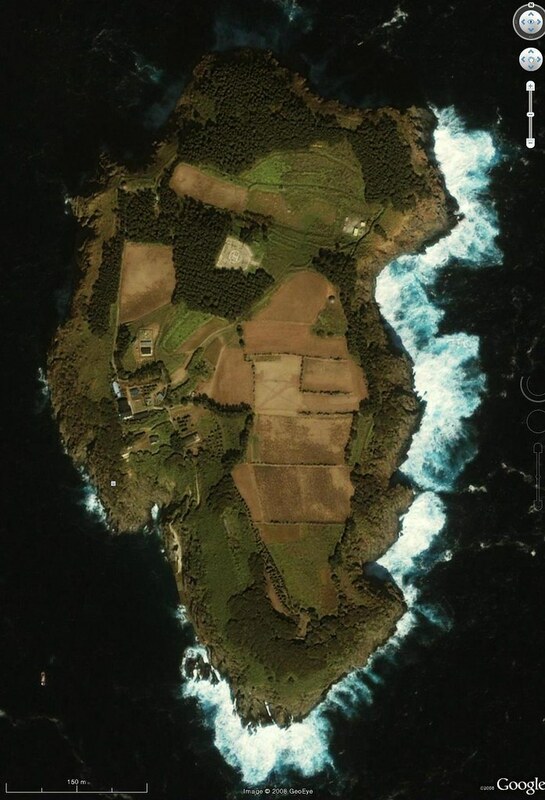 Also, what is the symbol on the island for Matsushima? It is a little blurred. I am not sure if 1861 and 1863 edition really exists. As I commented above, Prof. Funasugi says there are 1853, 1854, and 1864 editions. Thank you, 小嶋日向守, but what does ヨリ and ユ mean in context of this sentence? Does 是ヨリ mean "here," or "this island," or "this place"? Also what does ユ mean at the end? The word "是より" is "これより" or "この土地から". The word "見ゆ"　means "見える" or "目に入る". Consequently, this sentence means as "この土地から高麗国が見える". From here You can see Korean land. We can see the land of Korea at this place. Korea is able to see from this Island. I would like to correct my last sentence. Korea which is able to see from this Island. Korea can be seen from this Island. By the way, why he wrote "マツ" for name of Matsushima? I think simple reason which this margin is too narrow to engrave as "松". I am still curious about why Matsushima was written as マツシマ instead of 松島. I still feel it might have some significance, especially since this map was made in 1864, very near the time some Koreans were referring to Ulleungdo's neighboring island of Jukdo as "Songdo" (松島) or Songjukdo (松竹島). 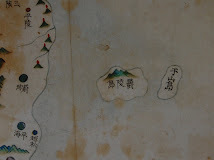 On THIS MAP, it seems rocks or smaller islands are written as シマ and the larger islands are written with 島. Otherwise, why didn't they write them all as either シマ or 島? 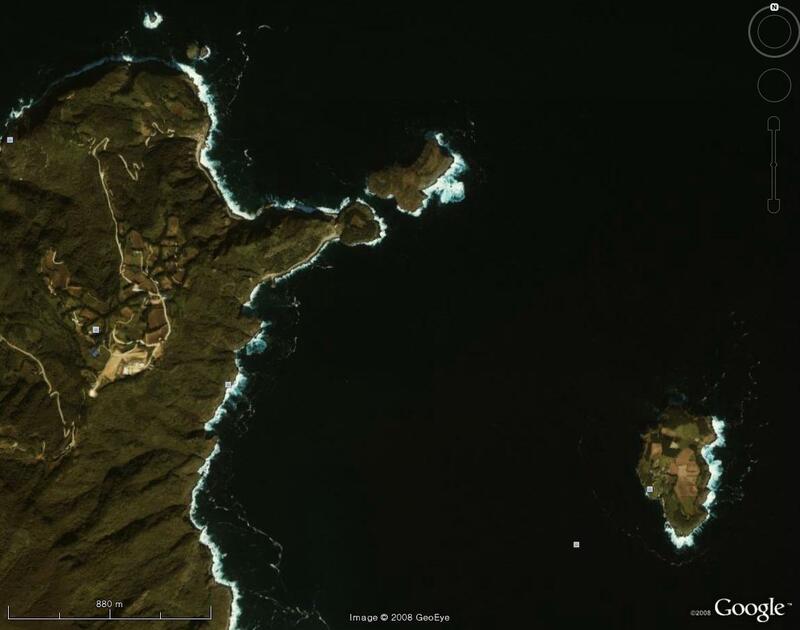 On THIS MAP, Ulleungdo's neighboring island of Jukdo is written as マノ島, which also could be written as マノシマ. Doesn't マノシマ look a lot like マツシマ? 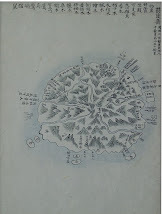 I think the second map "磯竹島略図" was made by modern map drawer such as Sakai brothers from Mito clan. The map is very sophisticated look, but it is an imaginative work in fact. 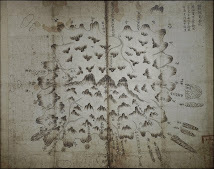 Please check 「まの嶋」in this hand-writing original map. 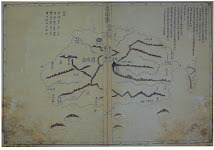 It is not a western style map of dotted print by copper plate. However it has so accurate geographical features. Thank you, 小嶋日向守. I think I have a general idea of what you are saying. Anyway, I think it is important to keep an open mind and consider a variety of theories. The characters 于(우) and 干(간) are easily confused, so 于山島 (우산도) became 干山島(간산도), which was reduced to 干島(간도), which is pronounced the same as 簡島(간도), which means "Bamboo Island," which can also be translated as 竹島(죽도). 間島 may just be an abbreviated version of 簡島. 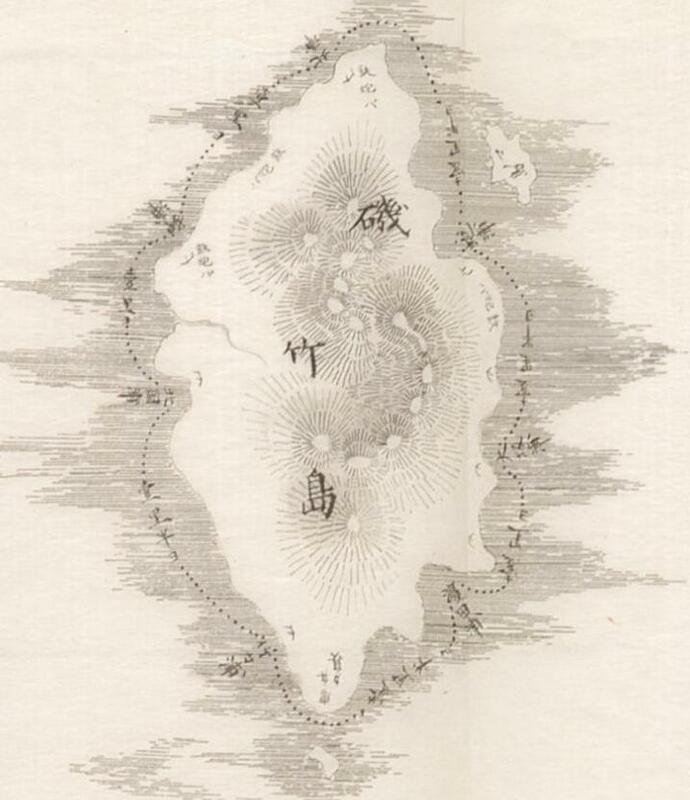 By the way, 干島(간도 can be translated as "shield island," which can also be translated as 防牌島(방패도), which was one of the islands mentioned in the 1794 survey of Ulleungdo. This　「松島」　might be “Dagelet”.